The national social insurance institution, Kela on Thursday revealed the 2019 edition of the maternity package for the new born infant. Particular attention this year was paid to the quality of the items included in the package, said a Kela press release. During the procurement, quality and price were weighted respectively at 70% and 30%, rather than the equal weighting they were given in previous years. There are altogether 63 useful items for families with a newborn baby. The selection of products included has, in keeping with the users’ wishes, stayed largely the same. New additions included a short-sleeve bodysuit and, for the first time, bodysuits with a boat neck. The clothes feature a lot of bright patterns, but also neutral colours that can mixed and matched. The design of the box is by Robert Lönnqvist and features colourful animal figures. The reveal of each new edition of the maternity package is preceded by more than a year of preparations. The procurement process for this year’s edition began towards the end of 2017. An advisory council with representatives from a range of organisations selects the products on the basis of recommendations. Each product must meet safety requirements imposed by Finnish and EU law. The products are tested carefully, and the quality of samples is checked. 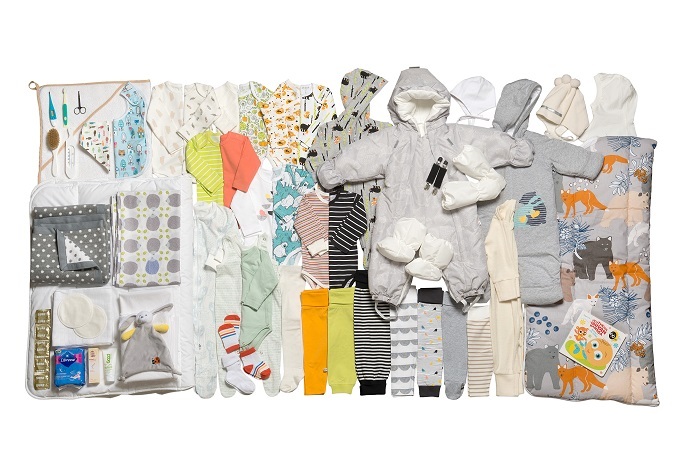 According to benefits manager Johanna Aholainen, Kela will continue to develop the criteria for responsible sourcing, and is looking at ways to make the maternity package more socially and ecologically responsible. The maternity package undergoes continual development, Aholainen said. The Act of Parliament establishing the maternity grant was passed in 1937, and the first maternity packages were distributed 81 years ago. The exact date of the changeover to a new edition varies slightly from year to year, because any stocks remaining of the previous edition must be cleared out first. Distribution of this year’s edition will begin at the earliest in mid April.